Emergency First Aid Training – Level A with CPR Training & AED Training – 1 Day, will help you to possess the skills and knowledge needed to help a person who is sick or injured until full medical treatment is available, preventing the condition from worsening, and/or promoting recovery. 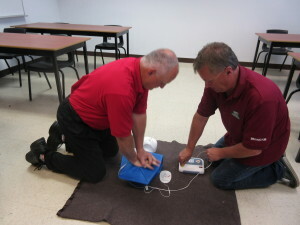 Your Emergency First Aid course – Level A with CPR course & AED course and certification will enable you to deliver initial intervention in a serious condition prior to professional medical help being available, such as performing CPR or using an AED while awaiting an ambulance, as well as the complete treatment of minor conditions, such as applying a bandage to a cut. Upon completion of this training, you will receive a wallet-size Ticket/Certificate that will show prospective employers that you have the right credentials. We keep your records on file permanently. Feel free to have your prospective employer contact METI to confirm your Emergency First Aid Training – Level A with CPR Training & AED Training Certificate. Back to our Safety Training.